NASHVILLE, TN (April 15, 2016) – On Wednesday (4/13), ACM New Female Vocalist of the Year Kelsea Ballerini celebrated her second consecutive #1 hit “Dibs” at a formal gathering in Nashville hosted by ASCAP. Surrounded by family, friends, and members of the music industry community, Ballerini was surprised by Black River Entertainment CEO Gordon Kerr with the news that “Dibs” now glimmers GOLD. Co-produced by Forest Glen Whitehead and Jason Massey, the follow up single to “Love Me Like You Mean It” has been officially certified by the RIAA for exceeding 500,000 sales and streams in the U.S. alone. Guests cheered on the “Dibs” songwriters – Ballerini, Jason Duke, Ryan Griffin and Josh Kerr – as the publishers (Black River Publishing, Dan Hodges Music and Nyssa Family Music) recognized each writer. 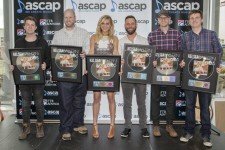 The day was extra special for all four ASCAP songwriters since it marked the first career #1’s for both Duke and Griffin as well as second consecutive #1’s for Ballerini and Kerr (Co-writers on “Love Me Like You Mean It”). Ballerini’s third single “Peter Pan” (written by Ballerini, Jesse Lee and Forest Glen Whitehead) continues to soar to new heights, entering the Top 40 this week on the Country radio charts. Alongside “Love Me Like You Mean It” and “Dibs,” the song is from her critically-acclaimed debut THE FIRST TIME. Adding to the excitement, Ballerini is up for three Radio Disney Music Awards – Best New Artist (all genre), Favorite Country Song “Dibs,” and Favorite Country Artist – and is also a first-time finalist for the ACCA Female Vocalist Of The Year and Breakthrough Female Of The Year. Ballerini will perform on both awards shows, airing on May 1st. Having shared the stage with Alan Jackson, Lady Antebellum, Tim McGraw, Carrie Underwood and Keith Urban, Ballerini recently performed at the Country CMC Rocks Festival in Australia and will join select dates with Billy Currington and Rascal Flatts this spring. Kelsea Ballerini launched to stardom with two consecutive record-breaking #1 smashes, making her the first solo female artist in 15 years to hit #1 with her first two country singles and one of only 11 women to have ever hit the top of the charts with a debut. Abuzz with high-profile media looks, the Black River Entertainment recording artist has been named “The Country Sweetheart” in People Magazine’s elite “Ones to Watch” portfolio, touted by Billboard Magazine as “Country’s Next Queen,” praised by Rolling Stone as the “Nashville It Girl” and selected as one of CMT’s Next Women of Country. Racking up her first ACCA, CMT, CMA, AMA and Radio Disney Music award nominations, she received Billboard’s “Rising Star” award at the prestigious 2015 Women In Music event. For tour dates and more information, visit KelseaBallerini.com. Reach out to her on Facebook, Twitter, Instagram and YouTube. Country Music News Blog participates in advertising programs that help fund the operation of this site. For more information please visit our privacy statement. This entry was posted in Kelsea Ballerini, Press Releases by admin. Bookmark the permalink.